Loadbrook Farm, Loadbrook, Nr Stannington, Sheffield S6 6GT. Loadbrook Farm is an 18th century farmhouse nestling on the edge of the beautiful Peak Park on the west side of Sheffield, but is within easy access of the city centre which is only 20 minutes drive away. 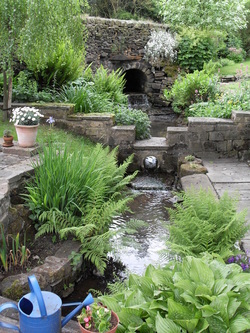 With a stream running through the garden, guests are guaranteed a peaceful and tranquil stay in a rural setting. We are conveniently situated for the Peak Park and all its attractions, including Chatsworth House and the Derwent Valley. It is also very close to Sheffield and all its amenities, including the Universities, Ponds Forge, Meadowhall and the Theatres. No longer a working farm, the property has been carefully renovated over the past 10 years, retaining much of its original character and charm, with livestock grazing in the nearby fields. A cottage garden has been created to provide a relaxed outdoor seating area for guests, and there is ample parking within the farm yard. Loadbrook Farm has been run as a small bed and breakfast establishment for the past 6 years, providing a welcoming and personal service. Breakfast is served in the charming old dining room, and all appetites are catered for from continental to full English, prepared with fresh local produce. The guest bedrooms are spacious and have been decorated sympathetically, retaining their original beams and high ceilings. The accomodation in a private wing of the house comprises a choice of twin with en-suite or double with private bathroom. All rooms are non-smoking, have TV (with Freeview), WiFi broadband internet, and tea and coffee making facilities. Pets are welcome by arrangement.